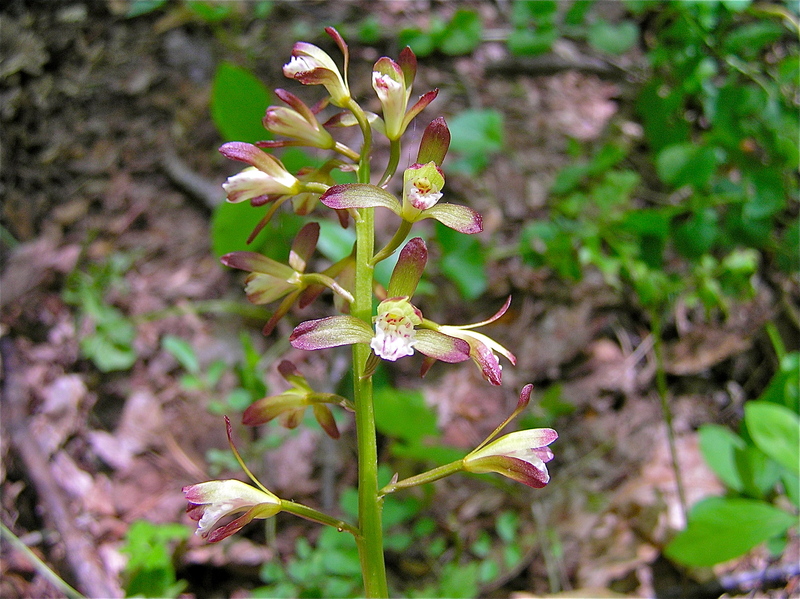 Putty-root orchid is found throughout Virginia in moist forests, but it is often obscured by other herbaceous growth in the spring and summer, and by leaf litter in the fall and winter. In early May, you’ll notice the flower stalks emergining from the ground. In the early stages, the flower stalk sort of looks like a brown asparagus spear! The putty-root orchid life cycle begins underground as a small tuber. This tuber contains a soft putty-like substance that was once used by settlers to fix broken pots, hence the common name. A single new leaf emerges from the tuber in the fall. It is dark bluish-green and pin-striped with white parallel veins. The leaf is ‘evergreen’ in the sense that it persists throughout the winter, even under snow. In April, the leaf begins to fade away. It is replaced in early May by a tall stalk of dark-colored flowers. From a distance, the entire panicle of flowers looks brown, but upon close inspection, you will see the tiny orchids have a white lip, and the greenish petals and sepals are tipped in dark maroon (lovely!). Each flower is only a few millimeters across. The self-pollinating flowers produce large seedpods filled with dust-like seed. The seedpods persist through the fall and winter and are often still present when the flowers appear again the following year. The plant’s tuber divides to produce a new individual. Small colonies occur in one place in the forest because of this form of vegetative reproduction. Putty-root orchid is also called Adam and Eve orchid because the two parts of the tuber are so closely united (“cleaved” together like Adam and Eve). The subtle coloration and staggered life history of this little orchid conspire to make it a well-kept secret of the Appalachian woods. Look for it when you are out on your next outdoor adventure! Click on any photo in the gallery above to watch this plant’s unusual life cycle play out over the course of the entire year.